The Barcelona’92 Games’ environmental legacy can be divided in three branches: sustainable polices, sustainable design and environmental recovery actions. The ‘Barcelona model’ is many times presented as just an urban management and forgetting all the environmental measures that the City Council developed. International influences, such as the Earth Summit in Rio and the European socialdemocracy, were a key factor to understand why Mayor Maragall, a pragmatic sociademocrat open to the liberal economy, planned Barcelona’92 as an investment to develop the city in a sustainable way. The Maragall’s government established Keynesian economic policies based on public investments in different municipal areas. The 1992 Summer Olympics became an evidence of those policies because the were conceived as a strategy to modernize Barcelona. The 1992 Games were awarded to Barcelona in 1986, the very same year that Spain joined the European Economic Community (EEC) and that an European environmental policy was instaured (articles 130 R-S-T at the Single European Act). The EEC passed a new specific ecological law for urban ecosystems called ‘Green Book on Urban Environment’. This document established guidelines for a more efficient management of industries, energy and wastes, apart of a more rationalized traffic and the creation of new parks and green areas. The Maragall’s government was politically inspired by Europe because of their modern, progressivist and socialdemocrat ideals. Furthermore, Barcelona’92 was planned according to similar international aims. The 1992 Olympics achieved milestones in sustainable management so the Games proved that environmental protection can be perfectly integrated within the organization of sport mega-events. Barcelona’92 produced a legacy through a positive image and a new engagement towards Barcelona as a city brad, a process usually known as ‘Barcelona model’. The Games were a key element within a municipal strategy launched when the bid was presented: a strategy based on sustainability and urban regeneration. This plan implemented the creation of new parks, the renewal of the sewer system and the city was rediscovered the Mediterranean sea after the redevelopment of the coastline. The mentioned sustainable design meant the construction of facilities and new urban áreas that, two decades later, are still in force. The City Council had planned the implementation of an environmental regeneration along the entire metropolitan area during the years that the 1992 Games were prepared. This strategy was based on three milestones: the shoreline renewal, the reduction of atmospheric pollution and the promotion of green areas. The municipal authorities developed an urban legacy in previously abandoned neighbourhoods thanks to the introduction of environmental measures. At the same time, ecological issues were gaining social and political transcendence (1992 Earth Summit in Rio). The Municipality and the COOB’92 managed an environmental vision since the moment the IOC decided that Barcelona would host the 1992 Olympics, so there Games were pioneer while we consider the existence of ecological and sustainable plans throughout Olympic events. 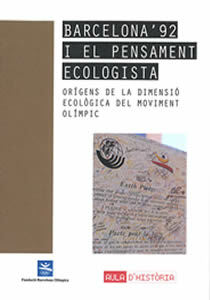 Barcelona’92 i el pensament ecologista : orígens de la dimensió ecològica del moviment olímpic / Alberto Aragón Pérez. Barcelona : Fundació Barcelona Olímpica, 2017.